EV Fest 2nd Public EV Charging Station Show - Sunday, January 22nd, 2017! Public Charging Stations at Toronto Region Conservation Authority are not yet Turned on, and the Schneider Electric Stations are strictly for Fleet Vehicles! Please Register using This Link for this event, Now! 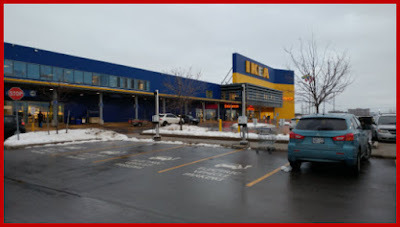 So - we are moving Next Door to IKEA, who is equipped with 4 convenient Spaces to share 2 EV Charging Stations, and we can discuss the coming DC Quick Charger at IKEA, while there! Just over 24 hours remaining! More Complete Directions now updated on the Event Page now! Two 48A Sun Country Highway chargers wrapped with IKEA's wrapping. Map marker location is exact, 4 EV parking spaces in front of the two chargers. Opposite the curb/sidewalk behind the chargers there are an additional 4 spaces "reserved for low emissions vehicles", in case the 4 EV spaces are ever all full or ICE'd! Happy New Year! Join us for our 2nd EV Charging Station Show! This one in Vaughan, Ontario, on Sunday, January 22nd, 2017! First one in Vaughan, Ontario! Noon to 3 PM Only. Basically, to get to this event: Exit Hwy 400 for Hwy #7 East, Travel towards Jane, St., but Turn South at Interchange Way. You can Also Get to this Event from the 407 ETR: Exit Jane St., North, Turn Left at Interchange Way, and continue past IKEA, as above! From Highway 7, Eastbound after exiting the Highway 400, travel towards Jane Street, Turn Right (South) at Interchange Way, travel to the End where it meets an intersection in front of IKEA, Turn Right (West) by the IKEA Flags. 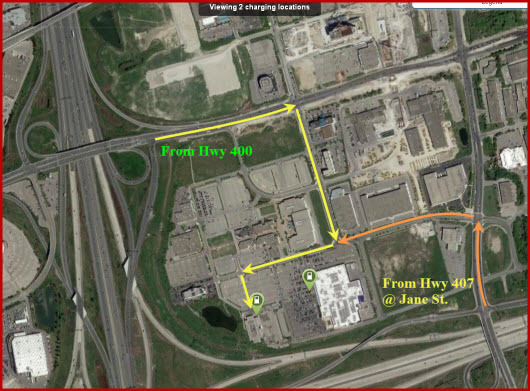 If you are coming from the Hwy 407 ETR, at the Jane Exit - continue Straight through. Continue west past the 1st IKEA Entrance on your left, and 2nd Entrance on your left, until you are at the Third sign for IKEA Parking, and have moved to the Left Turn Lane there, Turn Left (South), and continue South right into parking lot. As you enter, you will be at the Level 2 Charging stations. DC QC Chargers are just to your left around the corner! Get More Complete Directions on the EV Fest Website now! Join us with your Electric Vehicle, share EV Charging Experiences, Tips, and Discoveries, and help us all grow!